The intricate, multipart installation (11 May – 29 July 2018) manifests the artist’s fantasy of Detroit. Seven large-scale paintings, rendered in a rich and moody palate of blues, depict the artist’s vision of specific Detroit neighborhoods he has never visited. The abstract works use primitive shapes and symbols to investigate the visual language of displacement and place. Waves, ships, and city buildings, drawn with short energetic brushstrokes, populate these insular worlds. The formal, hard-edged palette suggests that this fantasy world is perhaps sturdier than the one we can see around us. These unique imaginings invite viewers to reflect on Detroit as a place, and as an idea – a parallel dream space. For the exhibition, Tal R has created a one-of- a-kind, 52-page Detroit newspaper, which will be distributed to the public at the exhibition. 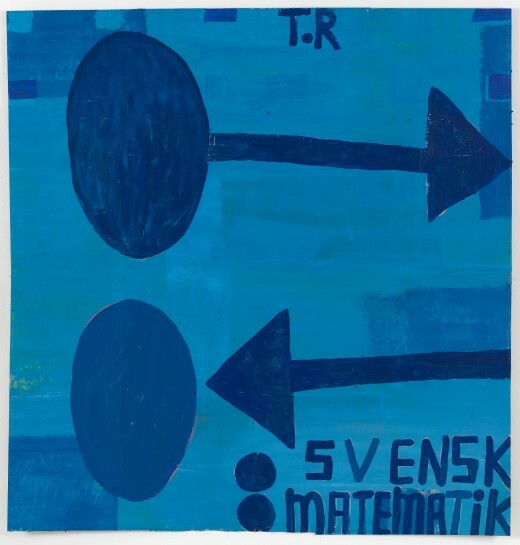 Reminiscent of Kafka’s Amerikka – his novel written about America, from Europe – this is not Detroit is Tal R’s sincere investigation of American iconography from his studio in Denmark. All works in the show, including the paintings, will be completed in Detroit, at MOCAD, as part of the artist’s immersion in the space. The newspaper will comprise a physical element in the show, displayed beside a papier-mâché wall in the gallery.